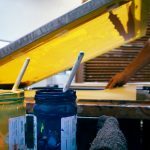 Regardless of whether you are using a sophisticated commercial press or one that you made yourself, it consists of three primary components: the work surface, the squeegee and the frame. The work surface or bed of the press should be perfectly smooth and flat. Imperfections in the work surface show up as imperfections in the print. The primary function of the frame is to support the screen mesh during the printing process. Today, both wood and metal screens are used by screen printers. Many sign shops select the wood frames because they are lower in cost. The wood frames, however, are prone to swelling and warping. Some old timers in will staple the fabric to a wooden frame, stretching the fabric by hand. 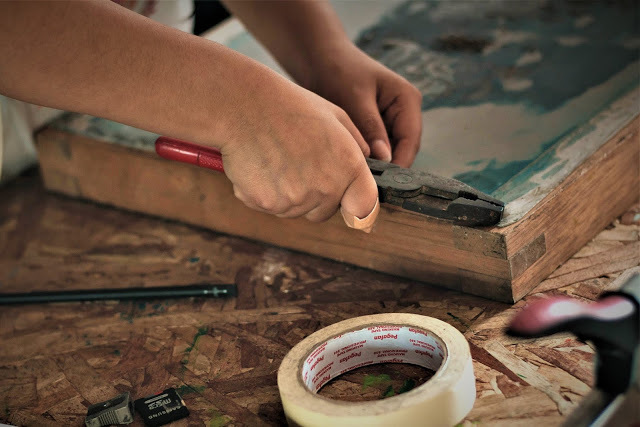 Although this is a quick, inexpensive method for adhering the fabric to the frame, it is an unreliable method. For the small shop that is not ready to invest in mechanical or pneumatic stretching equipment, the best advice is to buy prestretched screens from a sign or screen print supply distributor. Another option is to buy retensionable frames, such as the Newman Roller Frame by Stretch Devices. I prefer the roller frames, because if the screen tension loosens up, you can retension the screen. You can’t do that after you glue or staple fabric to a frame. Constant screen tension throughout the entire duration of the press run to maintain printing registration. If the screen is not stretched to the proper tension, the mesh openings of the fabric will be reduced. The smaller openings will restrict the flow of the ink and consequently the thickness of the ink deposit. Improper screen tension can also cause problems with the screen pop or screen snap off. If the screen doesn’t pop properly, there can be a loss of detail and definition. Improper tension can also cause distortion of the image and misregistration of multiple color prints. If the screen is not stretched to the proper tension, the mesh openings of the fabric will be reduced. To compensate for poorly tensioned screens, some printers increase the off-contact distance. (Off-contact distance is the amount of space maintained between the mesh in the frame and the substrate that you are printing.) Rather than correcting the problem, this can actually exacerbate the elongation of the image and cause misregistration. As the screen stretches, the stencil in the screen can also prematurely break down. After a screen is stretched, the tension of the screen should be checked with a tension meter. To ensure accurate measurements and to test for consistent tensioning, measurements should be taken at several places on the screen. Consistent screen tensioning is important or image distortion and misregistration of multiple colors can occur. Screen print fabric can be stretched on to the frame using a number of different tensioning devices and techniques. Traditionally, fabric tensioning was performed using mechanical and pneumantic stretchers. In recent years, retensionable frames have gained popularity. The advantage of these frames is that the tension can be adjusted as needed. Higher tension can also be attained using these frames. And there is no need for adhesives. Premature stencil breakdown or fabric wear.